Entertainment Systems has announced its presence as a viable cassette label with its inaugural 3-tape batch early this year. I’ve already covered the exciting (and possibly last!) 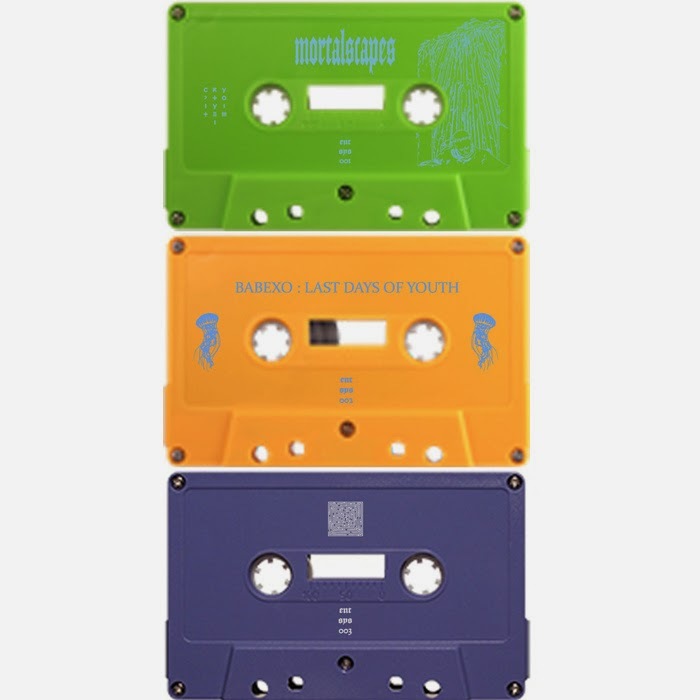 release by Rome’s Babexo, Last Days of Youth, over yonder at Critical Masses – hey, look, a link to it! Sorry, sorry, I’m not here to shill for my other ventures, but Babexo’s release was just right up my alley, and the perfect intro to Entertainment Systems. But there are two equally compelling releases that I haven’t had a chance to fawn over yet, and now seemed like the perfect time to do that. How’s it for you, OK? You got a moment? Excellent, let’s hash it out. Cryptosystem I (Joseph Morris, aka Druid Cloak) shoots the vastnesses of altered realities and abstract planes in a sand skiff of his own devising, rendering in 3D what only has been briefly glimpsed in the mind. Sound lysergic? Mushroomy? Eh, maybe – but it’s a little dark and cyber-weird for the average drug trip. You might lose a synapse if you’re on something. Instead, these are Mortalscapes, like the title suggests, deep dives into the human mind. The results are extractions of the psyche, so there’s a bit of a dark tinge to this bad boy. It’s a little bit ambient, a little bit electronic, and a little bit darkwave-y – and it’s a whole lotta awesome. The Entertainment Systems bandcamp page simply suggests that Gloom Fortress, the superbly titled tape from Dagir Du, is “open world journey music” and “passages for foggy travels.” I’m not going to argue with anything right there, because that’s just where this cassette takes you. Imagine remote mountain passages and a hidden stronghold that’s barely accessible by air, let alone ground. That’s exactly where “Bockibocki” opens the album, with shimmering synth and Final Fantasy snow-world soundtrack brilliance. And that’s also exactly where the album goes, experimenting with the vibe on the also excellently named “Tomb Drifter,” although Dagir Du allows fragmented beats and noise to invade tracks like “Fragd Beyond” and “Vile Boy VII.” Also – who or what is Dagir Du? So yeah, that’s Entertainment Systems for you – three months and three releases in, and I’m already in for the next round. Can you still get your grubby paws on these hot tapes? Don’t waste time, they’re running out… (as all good cassette labels do, of course).